The ELMAN W. CAMPBELL MUSEUM, owned by the Corporation of the Town of Newmarket and operated by the Elman W. Campbell Museum Board of Management, is a non-profit, educational institution created for the purpose of collecting, preserving, researching, studying, exhibiting and interpreting artifacts related to the social, political and economic history of the Town of Newmarket and its environs from the time of the first settlers to thirty years before present, for the benefit of residents of the Town of Newmarket and visitors from outside the Town. The Elman W. Campbell Museum is wheelchair accessible. To view a 360​°​ panorama tour of the Elman W. Campbell Museum, click the image below. The Elman W. Campbell Museum offers heritage school programs for students in kindergarten, grades 1 and 3 (during the school year). Students will learn about the theme through objects in our collections and engage in hands-on activities. For bookings or inquiries, contact the Museum at 905-953-5314. 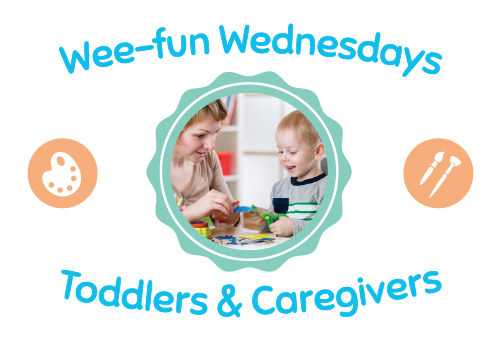 Drop-in with your toddler to socialize, learn and play! Activities will stimulate communication, cooperation, and imagination with a different art-making theme each week. Please note: We have had an Eggceptional response to the event and we are now at capacity. We look forward to seeing you at our other upcoming events, please pre-register early to join the fun! Saturday, May 11, 2019 | 1:30 to 3:00 p.m.
Decorate and design a terra cotta flowerpot and homemade greeting card for your Mom. Visit the Museum for fun, hands-on activities for the entire family! Express your creative talents with Scrapbooking, one of the Queen Victoria's favourite pastimes and learn about her from a special commemorative display. Experience a slice of royal life through hands-on activities including make & take crafts, activities and enjoy a piece of our Royal Birthday Cake. Don't forget to bring a camera for some great photo opportunities. Opening Ceremony June 6, 2019 2 p.m. Ribbon Cutting Ceremony, reception to follow, videos, music and information. The Elman W. Campbell Museum will commemorate the 75th Anniversary of the allied forces landing in Normandy on June 6, 1944. This was one of the largest military assaults in history, and marks the beginning of the end of the Second World War. Discovery a wide range of pictures, uniforms and artifacts dating back to Second World War. Drop-in and learn about the cultural diversity of First Nations, Métis and Inuit peoples through our collection of artifacts and reproductions. Experience Indigenous tradition through your taste buds and enjoy playing hands-on activities with your children. Join us for a guided tour and sample traditional Indigenous drinks and food like cedar tea, maple syrup, strawberry drink and bannock. Enjoy an afternoon of educational and fun crafts, stories, games and activities while learning about our First Nations, Métis and Inuit peoples. Sample traditional Indigenous drinks and food like cedar tea, maple syrup, strawberry drink and bannock. Monday July 1, 2019 | 10 a.m. to 3 p.m.
Join us at the Elman W. Campbell Museum for our Canada Day Open House. July 1, to October 31, 2019 | Free Admission | Tues to Sat 10 a.m. to noon & 1 to 4 p.m.
'200 Years of Yonge Street' (portrayed in quilts) Made by the Women's Institutes of Yonge Street from Toronto to Thunder Bay. 'Sew Many Memories' See the evolving sewing tools from Victorian times to 1960s from our collection.